Sucker-rod pumping units can be operated over a range of pumping speeds. It is expressed in Strokes per Minute (SPM). Obviously, this assumed that the up and down stroke of a unit forms one complete stroke cycle. Sucker rod pumping speed can be calculated manually using a stopwatch or automatically by the mean of a pump-off controller (POC). This article will detail the manually pumping speed calculation procedure. Start the stopwatch at the bottom of the stroke and measure the time it takes for the unit to complete 10 strokes. Stop the stopwatch at the end of the 10 strokes when the PU is back at the bottom of the stroke. Make a note of the number of seconds it took. Convert the number of seconds into minutes (divide by 60). Divide 10 (the number of strokes) by the time in minutes to obtain the pumping speed expressed in strokes per minute (SPM). Exercise: Calculate the pumping speed of this PU. Why Do We Counterbalance Sucker Rod Pumping Units? A good understanding of counterbalance is vital to the successful operation of surface sucker rod pumping units. Poor counterbalance practices can cause early failure of the gear reducer gearing and will result in excessive energy cost. 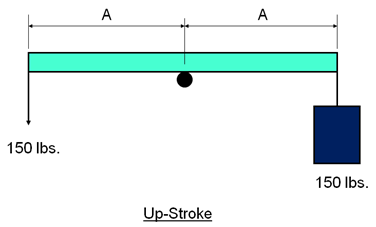 The figure above represents a simple non-counterbalanced lever system. On the up-stroke, by pulling down on the end of a beam, a man is lifting a bucket full of water having a combined weight of 150 lbs. Note that the upstroke effort of the man is a substantial 150 lbs. This article helps understand the difference between Conventional & Mark II pumping units in term of production performance. SROD, the predictive program from General Electric (GE), has been used in order to compare the Reducer Torque Performance, the Stroke Length, and the Polished Rod Velocity, of a conventional unit and a Mark II unit. In order to do that, production data from the well MF-1 are used. MF-1 is an oil well activated using a sucker rod pump. The target rate is 500 BPD, the pump is set at 6000 ft, the plunger diameter is 1.5 inch, the rod string is 86, the stroke length is 144 inch and the pumping speed is 13 spm. SROD, the predictive program from GE, has been used in order to compare the reducer torque performance of a conventional unit and a Mark II unit. The plots “Torque (in in-lbs) versus the crank angle” are depicted in the following graph. 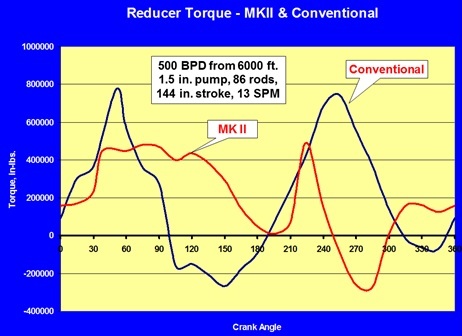 Note that the MKII does a better job approaching the uniform torque goal than the conventional unit and therefore has lower peak torque.